The second round of preliminaries for the sixth annual The Woodlands Idol competition was quite a bit different than the first, but every bit as fun and entertaining. The majority of the contestants went with country music selections, both classic and contemporary. But musical genre isn’t the point – what matters is that the song being performed by the contestant is one that they can truly perform. That would be my one bit of advice for any contestant regardless of the song – get that performance down. Practice it all the time. Memorize every word, every beat, every pause. Know when you need to take a breath and when you’re going to have to sustain a note to the point of breathlessness. Don’t strive to sound exactly like the professional artist – the judges aren’t looking for impressions. They’re looking for talent. While doing a little research this week, I discovered a number of our contestants this season are returning from previous seasons – including a past Woodlands Idol! In Round One, 2011 The Woodlands Idol winner Frankie Pizano competed again, singing Chubby Checker’s “The Twist,” and moving on to the semi-finals. Jim Tillmans was the third place winner last year, and is once again on his way to the semi-finals. Lacey Prieto has been a preliminary winner for the past three years and has done it again this year. And this season’s Round One People’s Choice Winner, Tara Leigh, was a preliminary winner in 2011. Suprising many of the long-time Woodlands Idol fans was Bradley Jackson (#12) not getting selected by the judges, or winning People’s Choice, as he has been a preliminary winner the past three years running, and a semi-finalist in 2011. It could have been due to his choice of song, U2’s “With or Without You,” he did seem to struggle with this tough one for many people. This week’s People’s Choice Winner is Karen Gathman (#1), who had performed Stevie Nicks’ “Gypsy,” and more power to her; trying to get all those lower-register notes and not go flat takes some real effort, which is probably why this difficult song is more often better covered by men. For pictures of the second preliminary event, check out our Flikr Album. If you haven’t attended one of the first two rounds of competition so far, you really are missing out. And if you’ve been to the first two and are supporting one of the preliminary winners when they go on to semi-finals but haven’t picked up your tickets yet? Don’t wait till the last minute to get them! 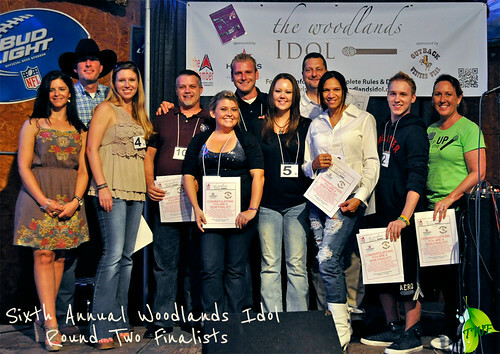 The third and final preliminary round of The Woodlands Idol is Friday, October 5. That’s the last night which is free to attend. The semi-finals on Friday, October 19, and finals on Friday, November 2, are ticketed events. All events are being held at Papa’s Ice House in Spring. Tickets are only $10 and can be purchased at each of the preliminary events, at all of the Woodlands Area Chamber of Commerce free business networking events (see our Event Calendar for dates and locations), at the Chamber offices of course, and by mail, when you download the ticket order form and finally, at the door. The sooner you get your tickets, though, the better as space will be limited. For more information about The Woodlands Idol competition, check out our Woodlands Idol page or The Woodlands Idol official site.